We recently received an payday loan email ad with the subject "Get approved for summer vacation cash in as little as an hour!" We cannot think of a better example of how some payday loan companies are being irresponsible with respect to their users. Payday loans are an expensive form of borrowing. They should only be offered, if at all, to consumers when they have no other options. Payday loans, and really any loan, should not be used for vacation cash. As a consumer you can protect yourself from unscrupulous offers. Only use a payday loan when you have no other cheaper option and you really need the cash. When considering different options consider two areas: 1) where to get cash and 2) why the cash is needed. In the first case, other options include borrowing from friends and family but if you are considering a payday loan there are most likely no other sources of cash so thinking of options here is not very useful. A better solution is to consider the second area -- why is the cash needed? Consider if you really need the cash right now. For example, can the expense wait? Can you save up for the purchase? Can you take a second job to help save up? It is much better to save up for your purchase than to buy the item now with a payday loan. Payday loans are expensive and you end up paying much more for the item than it is worth. In addition to over paying you put yourself at risk of getting into deep debt, putting at risk a lot more than the cost of waiting to buy something. Situations where it might make sense to use a payday loan are when the expense cannot be avoided. For example, to cover an unexpected medical expense or to keep the power on in the winter. A good way to double check if you are using payday loans correctly is to see how often you are taking out a payday loan. Since emergencies by definition should not happen very often payday loan borrowing should not happen very often. This means appropriate usage is maybe, at most, 1-3 payday loans every 12 months. If you see that you are using a payday loan more than that you are most likely taking out too many payday loans. If you are misusing payday loans you are not alone. 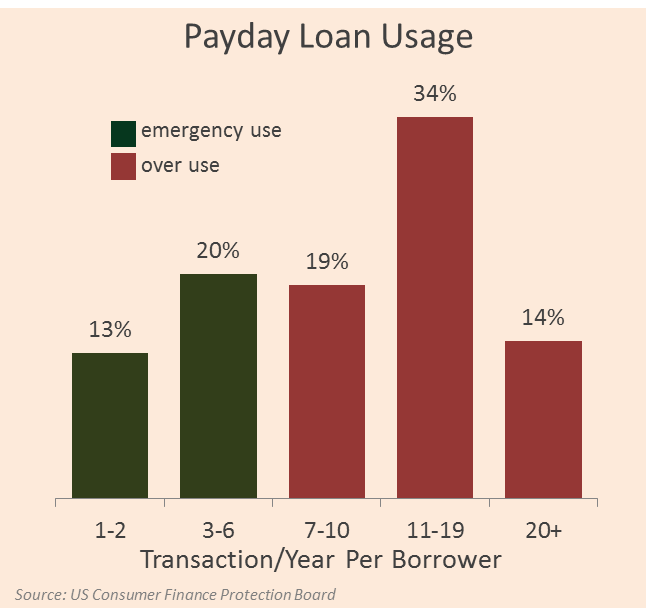 As the chart above shows, a recent study by the Consumer Finance Protection Board found that about 2/3 of payday loan users use a payday loan 7 or more times a year. That is a lot of people misusing payday loans! Payday loan companies have done a good job making it very easy to get cash. This is an important service enhancement when needed in an emergency but this convenience should not be misrepresented or misused. Payday loans are not designed for quick, easy, fun cash. They are designed for emergencies. Protect yourself from lenders that are misrepresenting how to best to use a payday loan and make sure you only use them in emergencies. And as for that vacation? Sometimes staying at home can be just as fun and even less stressful -- especially if you don't have to worry about paying off a loan when you come back. Here are some great ideas for a staycation!